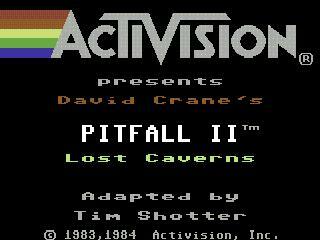 Released in 1984, Pitfall II: Lost Caverns broke new ground by being one of the first games to feature an in-game soundtrack and a vertically scrolling screen. Pitfall II helped define the platforming genre with a huge game world not thought possible for the aging 2600. Pitfall II also added infinite lives (dying sent you back to a checkpoint but cost you points), something real men did not need, but was probably added for the girly men in the gaming world. Note: Difficulty A and difficulty B are not separate categories because there are no noticeable differences between the difficulties. Best time: 0:05:02 by Tom 'slowbro' Batchelor on 2007-04-16. Best 100% time (max score): 0:09:47 by Chris 'cak' Knight on 2012-10-10. 100%: 0:09:47 by Chris Knight. tech info: Performed on Atari 2600 console (standard 1982 model), using 3-button Sega Genesis controller. No a/v mod. *whew* I'm 99% sure this is the fastest glitchless speedrun possible on this game. I never played Pitfall II nor a 2600 console prior to this year and learned every strategy on my own, though Douglas Korekach's still impressive record at Twin Galaxies inspired me to push my playing to the limits of sanity. Thanks to my family (hi Megan and Sarah) and friends; also thanks to the Japanese band Unita Minima, who often provided a mind-blowing soundtrack to mind-numbing practice sessions.